Of all the uniforms Wolverine has worn over the years his yellow and blue suit was his favorite by far. It wasn't quite as intimidating as his other looks, and was a lot less scary that what his opponents wore. But Wolvie wasn't too concerned about his intimidating opponents... His 12 inch adamantium claws took care of that for him! When Wolverine mutates, claws of adamantium spring out of the back of his hands. It's not comfortable. 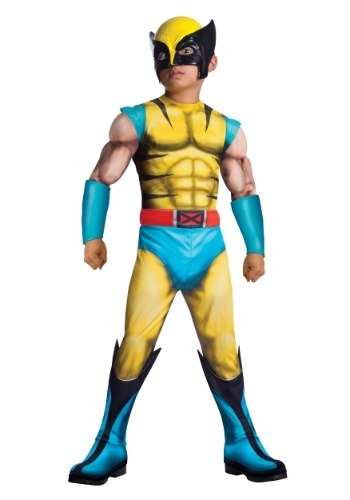 But if your child wears this Child Deluxe Wolverine Costume, he doesn't need to worry about that. He can have the look without the angst. Yeah, you could run around looking in every thrift store in town for a brown trench coat, but who's got time for that? Even if you find one, it's probably over priced, and it probably smells a little funky from whomever was wearing it before you, and that weird stain on the front? Nope, it's not coming out. Either way, what would you do for the armor? You're not going to find pink and blue armor sitting on the shelf anywhere with a fifty cents price tag, no sir. That's why our Gambit costume tee exists. An easy and comfortable look for Comic-Con or Halloween. Heck, wear it everyday! But be warned, you just might start speaking French and craving hot gumbo. Of all the X-Men Wolverine is the most famous and for good reason, this not so merry mutant is always the first into battle and the last to give up. If you were going to make a team of superheroes to fight by your side you'd want this X-Man with you. Now your little guy can suit up like their favorite Marvel hero when you pick up this Juvy Wolverine Hoodie! Wolverine might be able to survive a nuclear fallout with his incredible healing powers, but cold weather can still throw the X-Men all-star into a feral rage. Feral rages are all fine and good when you got plenty of enemies to fight, but when you're just chilling outside Xavier's mansion, making snowmen with all the youngster, it mostly just means you walk around grumpy all day. It's days like that that Logan reaches for this knit beanie. It's the perfect compromise between being the total bad boy of the X-Men and still being comfortable. Sometimes the hardest choice you need to make when being a superhero, is what kind of costume to wear. Most X-Men make the mistake of going with a lot of spandex; even Wolverine fell into that trap on many occasions. He finally came to his senses though and combined his costume with the most comfortable clothing known to mutant-kind, the hoodie. This version has all of Wolvie's signature style, including his pointy-eared mask, minus all the sissy spandex. Mutant healing powers come in pretty handy when you're facing off against Juggernaut, Mr. Sinister or Magneto. Of course, you have to be born a mutant like the X-Men to get cool powers like that , but you don't have to be a mutant to wear a cool outfit like one. This hoodie has all the details of Wolverine's outfit, except your kid can get away with wearing it to preschool and on chilly days. And that's what every toddler really wants; to look like a cool superhero when he's playing outside! There's folks that go out there and spend hundreds of dollars on their cosplay costume, and spend all their spare time sewing, molding, gluing, and casting. That's not much fun, and why do it when you can just get a comfy cozy t-shirt with your favorite character's look printed right there on the front? Exactly. With our Rogue tee, all you need to do is work on your Southern accent, and dye a few strands of hair white. That was easy, right? Now you'll have more time to sit around and read comics instead of stitching up an uncomfortably tight jumpsuit.